This is one of the roughly 100 pieces of new art that riders will find along the new Expo Line extension. 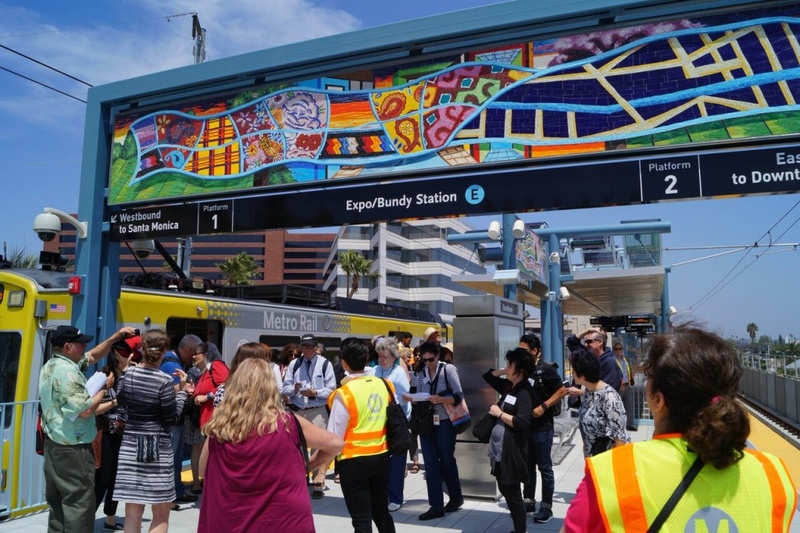 If you've ridden the Expo Line extension coming out of Santa Monica — and 12,000 Angelenos did the day it debuted in May — you know how crowded those trains can be. At peak hours, they're so packed commuters sometimes have to wait for one or two to pass by until they find a train they can board. The LA Metropolitan Transportation Authority announced on Friday it plans to start running trains every six minutes, beginning in December. Some trains will also get longer with the addition of an extra car. In many ways, the Expo Line is a victim of its own success. By LA Metro's count, average weekday boardings rose from 30,507 in June 2015 to 45,876 in June 2016 — a 50 percent jump. And LA Metro doesn't have enough train cars to keep up with surging demand. LA Metro has so far received 41 rail cars from Japanese company Kinkisharyo. Another 37 are expected to arrive by early 2017. They are being rolled out incrementally. We are building train cars right now. Our contractor, Kinkisharyo, is producing about four cars per month. We bring those cars in, we test them, we commission them and put them right on the Gold Line and on the Expo Line; you’re going to see big relief on both those lines very, very soon. Those cars are coming in at four a month. We’re trying to increase that to five per month. You’re going to see relief. As more of these light rail vehicles are tested and broken in, LA Metro also plans on deploying more three-car trains. Most Expo Line trains are only two or three cars long because the platforms at most stations can't handle longer trains.